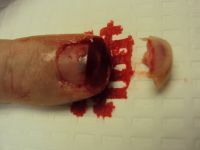 Fingertip amputations are common. Treatment goals are sensate, stable, nontender soft tissue cover. 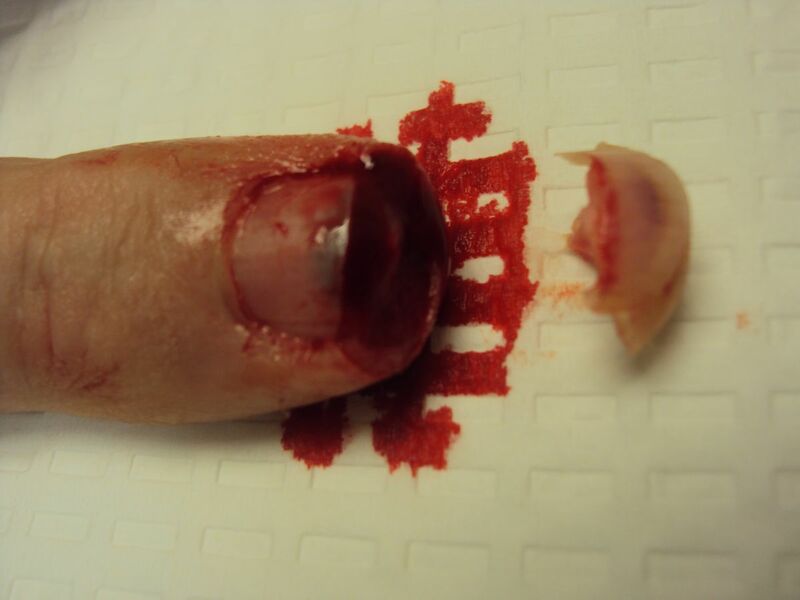 Fingertip amputations are described according to the angle of loss (lateral, dorsal, transverse, palmar), skeletal loss (soft tissue only, tuft, shaft, base) and zone of injury relating to mechanism of injury (sharp, crush, saw blade, thermal knife). Optimum treatment is individualized based on these and other factors. This case demonstrates the "open technique", simply letting nature take its course. The best results and indication for open technique is a dorsal oblique soft tissue amputation. The scar migrates dorsally and proximally, eventually covered by the fingernail. This is an example of this injury and treatment. This man's nondominant left index fingertip was pinched off in a closing furniture door. The amputated part was crushed flat prior to retrieval. Here, the distal end of the distal phalanx tuft is visible. The palmar aspect of the distal phalanx had been previously injured - a transverse distal laceration involving both digital nerves with good sensory recovery. The amputation mechanism also produced a new transverse skin rupture halfway between the old scar and the amputation margin. These new and old palmar injuries contraindicated palmar advancement flap reconstruction. One week after injury. Percussive desensitization is underway. 10 days after injury. Still quite tender to touch. 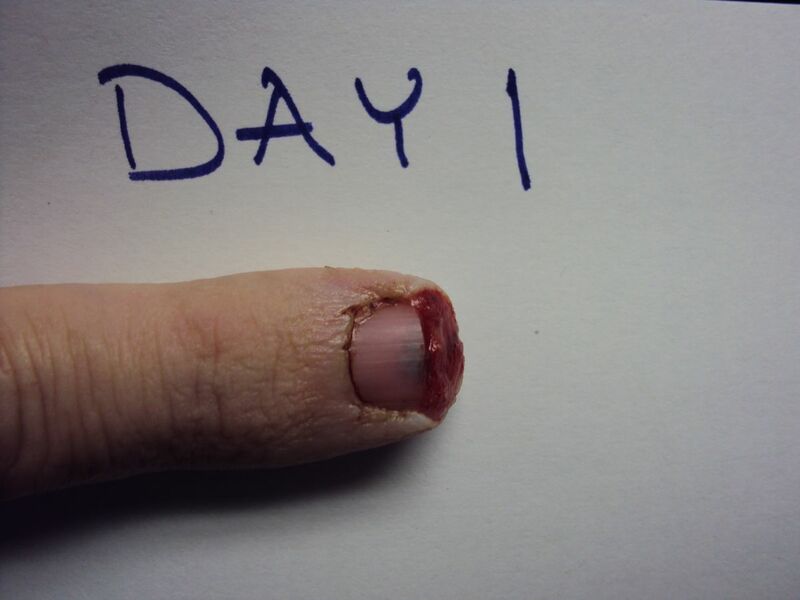 20 days after injury. The tip is numb - the fingertip feels as though it us covered by a thimble. Using the fingertip to tie shoes but not buttons. 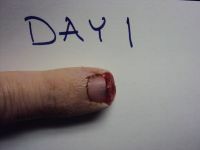 30 days after injury: the fingertip is regaining sensation, but distorted: touching a flat surface feels sharp, like an edge. Able to pull on socks using this finger. 40 days after injury. Recovery seems to slow down - the central healing area is dry, but not shrinking as fast as it was. No activity limitations, but guitar is still on hold..
Day 80 - two months. Dramatic tenderness is gone. Fingertip sensation is a strange duality of sharp and dull. Playing some guitar, expecting more improvement. Now two years out. Not normal, but not a problem in any way. 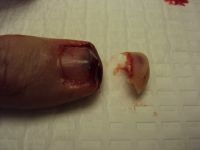 The final picture shows the typical fingerprint deformation resulting from the skin stretching up toward the fingernail.